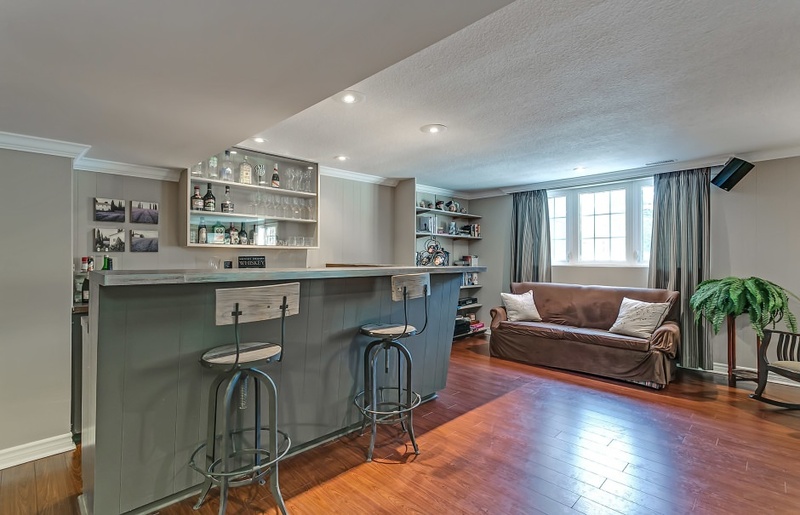 Renovated bungalow in one of the most sought after pockets in South East Oakville. 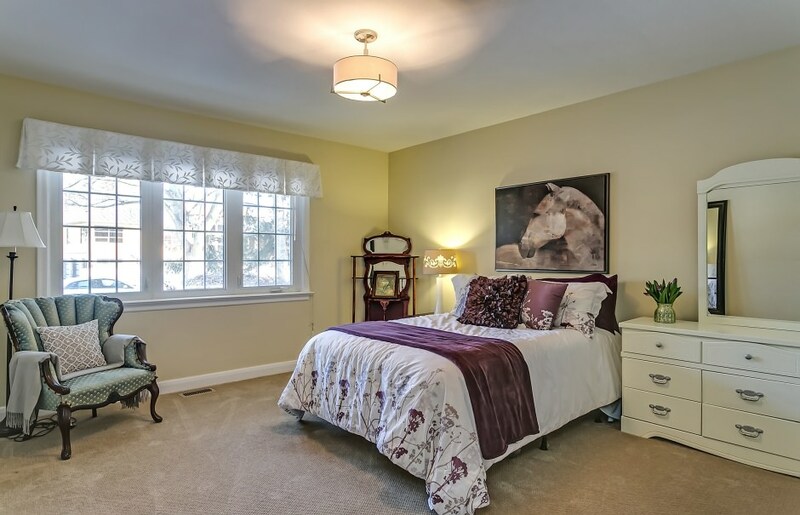 This spacious family home features 4.2 bedrooms over 7,000 total square feet. A bright foyer with slate tile flooring, wainscoting and crown molding, is flooded with natural light by an oversized skylight. A charming pocket door opens to the formal living and dining room. 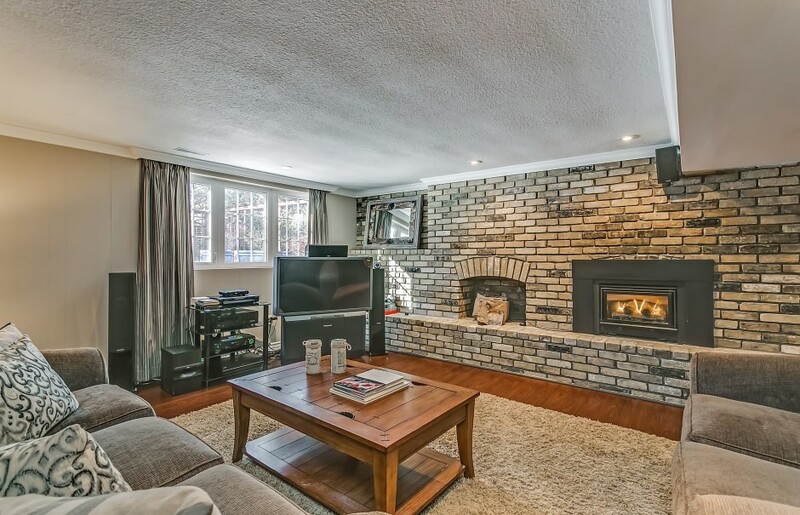 This double room features oak hardwood flooring, a gas fireplace with painted wood hearth and granite tile surround, and a dramatic wall of windows overlooking the front yard with mature South Oakville trees. The open concept gourmet kitchen and enormous yet cozy family room are the heart of the home. Custom soft-close cabinetry with brushed nickel hardware, and high-end stainless steel appliances surround the central island with bar seating. Quality materials are evident throughout, from the granite countertops to the marble tile backsplash. A spacious breakfast area is delineated by a central chandelier, just opposite the den with bay window and gas fireplace flanked by custom built-in bookshelves. Despite the panoramic windows and 14’ vaulted ceiling, the family room maintains an air of coziness. A gas fireplace features a built-in over-fireplace entertainment center with surround sound speakers. Double French doors walk out to a covered outdoor living room overlooking the in ground pool, ideal for al-fresco entertaining. The sleeping quarters are smartly tucked away, with a luxurious main bathroom, with heated limestone tile flooring and an oversized double vanity with quartz countertop, serving three good-sized bedrooms. The master retreat boasts an ensuite with heated limestone tile flooring, built-in vanity with marble countertop, and soaker tub/shower with rain and hand held showerheads, as well as a 15’3 x 12’5 boudoir with custom built-in storage. Two additional bedrooms and a three-piece bathroom are located on the lower level, as well as a massive recreation and games room equipped with a custom wet bar, built-in bench seating, brick accent wall with gas fireplace, surround sound speaker system, and multiple grade level windows allowing for plenty of natural light. The tranquil rear yard, backing onto a small ravine, is incredibly private. Custom natural wood privacy screens sit amongst mature cedars, enclosing the in ground pool and entertaining area. Premium court location, this home offers it all.